In general I try to make my blogs about reasoned argument. I try really hard to explain why I think what I do. I am always happy for people to disagree with me but I hope to show why I have come to the conclusions I have. Today is an exception. It is purely a statement more of how I feel that what I think. It is about attitudes and misleading statements on the NHS and doctors and many other things. I've been asked for my thoughts on the statement today by Jeremy Hunt, reported in the following ways: Jeremy Hunt: 'Doctors must work weekends': Jeremy Hunt Goes to War with Doctors: Jeremy Hunt: Doctors will have to work at weekends. On Radio 4's Today program he talked about the need to forge a "A new contract that brings back a sense of vocation.” And one of his justifications for this is that there are '6000 avoidable deaths' due to care being less good if you're admitted on a weekend. Medicine is very diverse, and it varies across the specialties. I work in surgery and hence that is very much my perspective and I appreciate that things might be a little bit different in other areas. However, basically he is talking nonsense. Of course we work weekends. There is always a consultant on duty on Saturdays and Sundays, High Days and Holidays. For the record, doctors who work Christmas Day don't get a premium pay, simply a day off in lieu. There are apparently lots of consultants who have opted out from working weekends. I'm not quite sure to whom he's referring. Seriously, the numbers overall must be small but let me take one example where that makes sense. Breast surgery is a specialty that mostly deals with cancer. There is some benign disease as well, but most of the work is cancer-related. As such, timing of surgery is urgent but not an emergency. And the pathways (since 2001) work really well with patients being referred by their GP, seen assessed and then treated in 2-4 weeks. Such work requires multi-disciplinary teams and a lot of coordination. However there is no good reason why this needs to take place on a weekend. If Mr Hunt is arguing that as the hospital buildings are there, they should be used to full capacity 7 days a week, that's fine. But it has very little to do with doctors. It is about making staffing levels at the weekends the same as week days. I am certain that the Honourable Gentleman is not proposing enough funding to pay for that. And how are we going to maintain the same level of staffing on week days if we are sticking to current hours limits? More worryingly for other professionals (nurses, paramedics, physios etc.) the government has muted taking away unsocial hours supplements. Seriously? You want people to work nights and weekends without any extra recompense? How do you think this will help the current recruiting crisis? So, is there sufficient resources out of hours for emergency care? Well, sort of. As surgeons we provide 7 days a week cover in teams. It can be frustrating when some of the diagnostics (i.e. pathology) is less available out-of-hours but rarely does this actually make a measurable difference to patients. However there is some room for manoeuvre here. But this doesn't seem to be what the Health Secretary is talking about. The '6000 avoidable deaths' Which is apparently all doctors' fault. (See the Radio 4 interview if you think I'm misrepresenting him): This figure is calculated from some work published in 2013. It showed that if you look at admissions to hospital, there is 1.3% 30-day mortality. (That is death within 30 days of admission). However this rate varied depending on day-of-admission, with Wednesday being the lowest and Sunday 16% higher. So to put that in context the risk of death rises from ~ 1.2% to 1.4%. The problem is that no-one is quite sure why this happens. 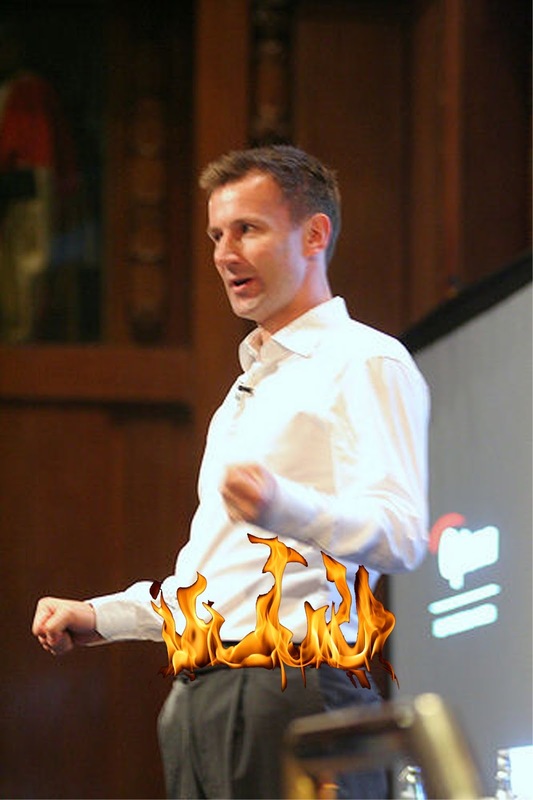 Hunt argues that the lower number of senior doctors on weekends able to make decisions is the culprit. This may be true but you cannot tell from these data whether the patients admitted at weekends are the same as those admitted on week days. Any doctor who works in acute care will tell you that many patients admitted on a week day will be less ill - but in need of some hospital care. It is complicated and we do not have the data. If it was simply a matter of weekend care being less adequate, then why is the death rate lowest for those admitted on a Wednesday and not a Monday/Tuesday as presumably those are the least likely to be still in come the weekend. Basically, what I am saying is that is complicated. If it is due to levels of staffing not being high enough on weekends then the doctors is only one small part of that. The press has talked about how much consultants are paid - presumably in order to shock the public that they are paid so much and refuse to work on weekends. Well, the consultant's starting salary currently is £75,000. After 5 years at medical school and at least 10 years of post-graduate training and experience. The majority of the post-graduate training self-funded. And taking on significant responsibility for the care of a large number of people. Doctors are far from hard-up, but painting consultants as on the gravy train is deeply offensive as is the argument that we as a profession lack a sense of vocation. In order to earn that, most consultants would be on something like a 1 in 6 on-call rota - hence working part of at least 1 in 6 weekends depending on the work pattern. In the 2012 Health and Social Care Bill, one little noticed provision was the removing from the Secretary of State the duty to provide comprehensive care to the whole population that was instituted in the 1948 statute setting up the NHS. This provision is arguably only symbolic. But Symbols can be really important. The NHS faces significant pressures, from an aging population, a big squeeze on finances (despite what they keep saying) and billions wasted directly and indirectly on a crazy reorganisation that made the NHS significantly less efficient and effective. Not to mention that the real crisis for the NHS is the collapse of social care. In the face of this, the government is striking out first - I believe today's announcement is a deeply cynical attempt to pin the impending disaster in the NHS on doctors. I am sure other NHS staff will be next. They are playing fast and loose with both the truth and our healthcare system. In order to protect themselves from the fall-out they are trying to make you think it's all the doctors' fault. I would never claim that my profession is perfect and we do need to improve in many ways but this is nothing short of a slap in the face to so many of my colleagues who are deeply committed and unbelievably hard working. The cry of anguish Why me? must be almost ubiquitous when life goes wrong. When faced with the big challenges, we inevitably find ourselves asking some form of this question. For a believer in God this question is directed as God, for the non-believer perhaps, at the universe. I think we'll all in pretty good company as the psalmists asked this question too. One could even argue that Jesus' words on the cross "My God, my God, why have you forsaken me?" come from the same place. And I don't think there's anything wrong with that. I think God's big enough to take it and certainly doesn't need me to stand up for him. But I was reminded on Sunday about the value of this question in a totally different context. How about asking Why me? 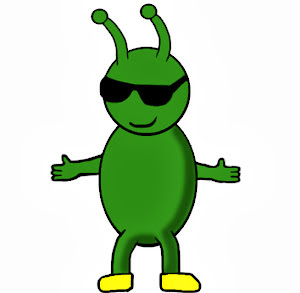 when things are going well. I would be inaccurate to describe my life thus far as a bed of roses or to try to deny that I have had to make sacrifices and work hard to get where I am. I think it is very easy to turn such truths into a self-made-man myth that so pervades our culture. And a myth it really is. I have had the following huge advantages. I was born in the UK, the sixth richest country in the world. I have had up until university, free education. I went to university when fees were a lot lower than they are now. All through my life I have had access to free healthcare. As a child, I had a mother who had the simple expectation that we would do our best. Nothing more, nothing less. Failure was always acceptable, not trying was not. At various stages of career and life I have had countless valuable opportunities. I lost my mother relatively young but because she planned well, I've had a big headstart financially. So I find myself with a home, a career that is challenging and rewarding and interesting. I have true and real friends. I have traveled widely, I have an expensive and interesting hobby. This could end up being a long, long list. It is true that I have made much of what has been given to me, but seriously how much have I been given!! So inevitably, I have to ask the question: Why me God? Why am I so, so, so blessed? There are some important ways to think about that question but for now just one thought: Please Lord, let me never, ever take it for granted. Whether you've heard the phrase before or not, if you are British you will definitely be familiar with the concept. Moral Hazard dominates arguments about healthcare, welfare, immigration to name just the most obvious three. I've written before about how often the most effective way to sell a lie is with a truth. My argument here is simple; Moral Hazard is being massively overstated. I am not suggesting it doesn't exist but it's over-representation is used to justify some really bad ideas. So let us begin with a theoretical (or not so theoretical) example. It would be easy to presume, reading our media that there is no such thing as a real refugee but I want to begin with the concept of someone who applies for refugee status or political asylum. There are technical differences between 'refugee' and 'asylum seeker' but it doesn't matter here. Let me give you a couple of examples of what we are talking about. The amazing story of Donald Woods is told is the breathtaking film Cry Freedom. Woods being granted asylum in the UK was vital to bringing to the world the story of the state-murder of Steve Biko and this was emblematic of Apartheid South Africa. I want to begin there because I think it important to establish just how vital is the concept of granting asylum. This is completely separate from economic migration: this is the idea that it is necessary to provide a safe haven for people fleeing for their lives. In a forest pit in the Democratic Republic of Congo, Aimee and her baby son were held captive with 25 others. After seven days, 13 were taken to be shot - with Aimee last in the line. With little Daniel in her arms, she saw the terrified men and women killed one by one. But when it came to her turn, the soldiers lowered their guns. Aimee said: "I was crying. I thought I was going to die with my child. Then I heard them argue about what they would do with my child. For some reason they changed their minds. I don't know why, only that I am alive today." After years of persecution and detention, Aimee Ntabarusha Mungu escaped from the Congo, fled to the UK and settled in Glasgow. She contacted the local Red Cross branch and used their orientation service to help her adjust to life in Scotland. She also regained contact with her family, who she had left behind in the Congo, through Red Cross international family tracing. Aimee said: "It was so hard to be here without them. A friend looked after them but they were always in danger as the government was after me. I wanted them here, safe with me." This is one of so many stories that can be found on the British Red Cross website. So let me pose a question in the abstract. Let us say we have 100 people claiming to be refugees. Let us assume for a moment 95% of them are genuine. And let us assume that our vetting process has no means of distinguishing between the genuine and the imposter. Should we let in all 100 or should we return them to where they came from? These are the choices. If we let them in 95 Aimees have been saved and 5 'bogus asylum seekers' have got in. If we refuse admission 95 Aimees have been sent to be tortured and/or killed but 5 people not entitled to enter the UK have been kept out. Where the argument really becomes interesting is when we play with the percentages... how about if 20% are genuine? So the number of illegitimate claimants who get away with it is significant but still we prevent 20 innocent people having a horrible fate. How about 1%? 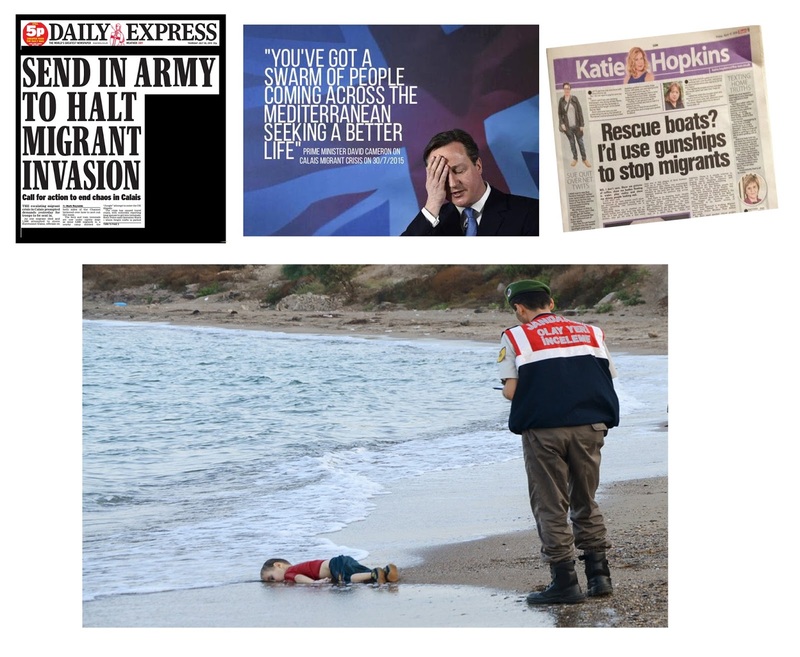 For 2013 there were 23,507 asylum applications to the UK. That's 0.03% of the UK population. So we're not really talking about big numbers here. 64% of applications were refused. (Three quarters of those refused appealed with around a 24% success rate on appeal). It is impossible to know what human stories lie behind these statistics but let me give you these examples: Hidden stories of failed asylum seekers. In that 64%, how many Simons and Josephines and Gabriels and Joshuas and Isas are there? There is, of course, no such thing as a perfect system but there is systematic bias. I think it is quite clear that the direction of travel with out system over the past decade has been to an ever 'tougher' system - seeking to deny as many claims as possible. To me, a 1 in 4 successful appeal rate suggests a systematic problem. So, let us propose for the sake of argument a system that is very lax (dangerous word) let us propose that we allow the majority of applicants to stay, maybe around 20,000. A number that the UK could easily absorb. So, maybe we would be granting asylum to some who don't merit it but Aimee and Simon and Josephine and Gabriel and Joshua and Isa would be safe. If you accept the responsibilities of the various post world war II refugee treaties, then I think the only reasonable argument to counter this is one of moral hazard. The concept that by allowing a small percentage of the undeserving in, in order to avoid the terrible risk of rejecting the truly needy we provide incentive for people to play the system, we effectively invite illegitimate claims. I am going to leave immigration there for a moment and move on to the issue of the Welfare state. Recently I have been supporting a friend through the process of a formal capacity assessment for the Personal Independence Payment that is replacing Disability Living Allowance. I will write a full blog entry on that alone but for now I want to just say, for context, that I have recently had dealing with the DWP (Department for Work and Pensions) and insight in to what our Welfare system currently looks like. It is worth remembering the concept of a Welfare state is an insurance scheme for everyone - because none of us know when we might be afflicted by unemployment or illness or disability. So as a society we all contribute and we all have the right to basic provision as and when we need it. I just want to add here that the lowest 10% of households pay more in tax (as a proportion of their income) than any other grouping (including the richest 10% of households). This is often overlooked as the poorest pay relatively little in direct taxation. Anyway, implicitly a system that provides a safety net has in it a moral hazard - if you don't have a job you won't stave, we have a basic income for you. If you are too ill to work, we will provide for you etc. etc. The various disability benefits is a good place to start to demonstrate the issues but it is a systematic one. In principal, assessing whether someone is fit to work, providing support to get back to work where appropriate and providing differing levels of support is the right thing to do. Successful appeal rates against WCA decisions currently run at around 40%. (This rises to nearly 80% when the claimant as access to proper legal support). I don't know about you but I would suggest that a system with a 40% successful appeal rate is a broken system. Obviously it is fraud for someone to claim this welfare payment when they are not ill or disabled. The official figure on fraud is 0.7%. So in a attempt to stop the less-than-one in a hundred who claim falsely we have constructed a system that penalizes the most vulnerable (by definition). Even if a claimant is successful the process is immensely stressful and demonstrably harmful to them. There are a number of deaths (at least 50) related to the benefit assessments and sanctions that are being investigated by the DWP. It's difficult to find the exact number as the DWP refuses to disclose this even after freedom of information requests. I want to propose that we should construct a system designed to ensure that we do not deny help to those who most desperately need it - even if by doing so we increase the risk of people taking from the system when there are not entitled to it. Once again the overwhelmingly loud counter argument - constantly in the media - is one of moral hazard. In healthcare we hear talk of moral hazard too. Thus far it has not, as yet taken hold so much in the narrative but it is often put forward that a free-service will see no end of demand. Charging people a nominal charge for visiting their doctor comes around repeatedly as a way of apparently stopping time-wasting patients from using healthcare inappropriately. I am very wary of this for a number of reasons. Prescription charges began as a nominal charge - before being massively increased. A nominal charge for one person could easily be prohibitively expensive for another. Patients as well as overestimating the significance of symptoms also often underestimate them too. There are some interesting studies that show how important it is for people to participate in their own healthcare. One famous one, showed that mosquito nets given away were hardly used whereas those sold at a nominal charge were much more widely used leading to a drop in malaria. However, how and where this is translatable to other areas is not straight-forward. Patient-own participation in their healthcare does not need to necessarily be financial and I would argue that people naturally have a stake in their own healthcare anyway. I think the mosquito net example has lots of potential confounders particularly relating to disease perception. Furthermore as the UK experience of dental care shows, the up-front costs deter many people from regular care. These are complex areas, it will never be possible to construct perfect systems but the debate is important. It is my contention that the argument is far from balanced. What is happening is that rather than weighing the risks of an over-difficult to access system (be it asylum or welfare or healthcare to pick these three examples) against the moral hazard of an 'exploitable system,' all we ever hear about are the moral hazards. As a consequence, systems are made more and more draconian and often Byzantine such that those who are most in need of them struggle to access them. This is not about raw statistics, it's about real people and real human suffering at the end of the line. It is almost impossible to have a rational discussion about this - the shouting down with moral hazard arguments is immense. I do not deny that the moral hazards exist and need to be addressed but I stipulate that if you look at the evidence they are wildly overstated. Maybe I am guilty of a tactical error here, maybe I should adopt the approach of the other side and ignore their argument and just shout, shout, shout and shout some more about the immorality of the systems we have designed for our selves. Maybe by acknowledging there is a point to their argument, I concede too much. I mean how many fake benefit claimant stories have you read in the newspapers? How many of these stories even mentioned the grave suffering of those wrongfully denied their entitlements? Ultimately though, the moral hazard arguments are used to an absurd level that they cannot sustain, it is long past time that we cut through them. This post is partly a placeholder for reference. Someone else might have done this already but I haven't found this direct comparison anywhere else. 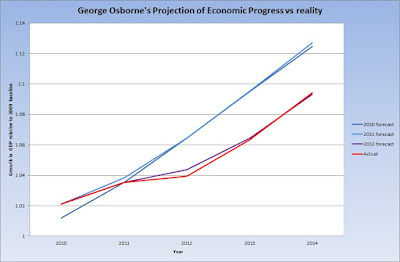 What I wanted to show here is the huge gap between George Osborne's economic projections and what has actually happened. If you read many of the economic blogs around this is talked about quite widely but I couldn't find the data put together like this anywhere. Next month Mr Osborne will lay out his 'emergency budget' because the last budget done this year by - well - George Osborne was so terrible he has to lay out a whole new one again just 3 months later. 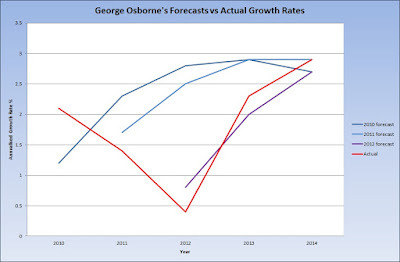 I have taken the forecasts from each of Osborne's budget speeches. Two points to note; firstly how wrong the projections from 2010 and 2011 were. And secondly how the prediction for the financial year 2010-11 was wrong in the opposite direction to subsequent years. 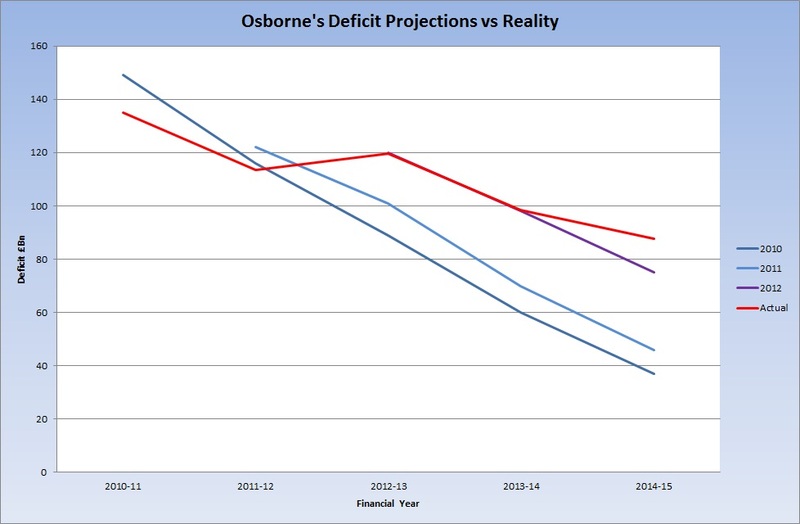 That is the deficit in 2010-11 was less than predicted and higher than predicted in each of the other years. This is true for the projections made in 2010, 2011 and 2012. The 2013 and 2014 projections were much closer to reality. 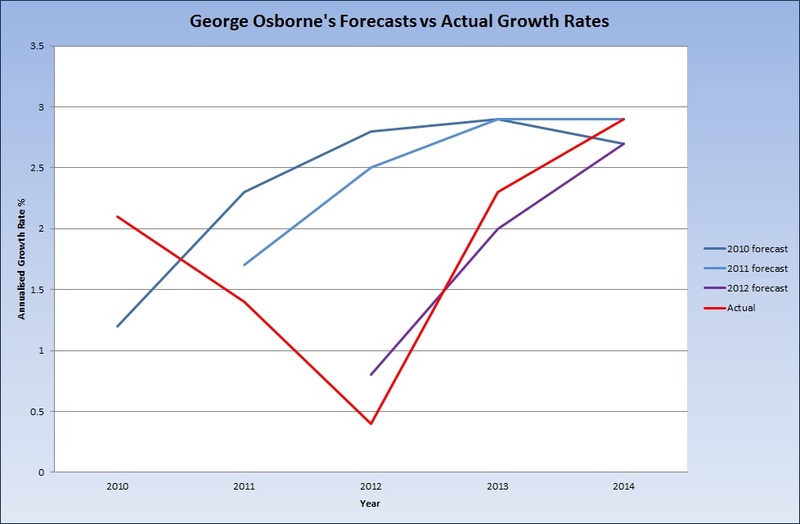 The chancellor hugely over-estimated growth in 2011 and 2012. 2013 was still below his initial projections with 2014 being basically in line. It's quite useful to look at these numbers summatively - i.e. 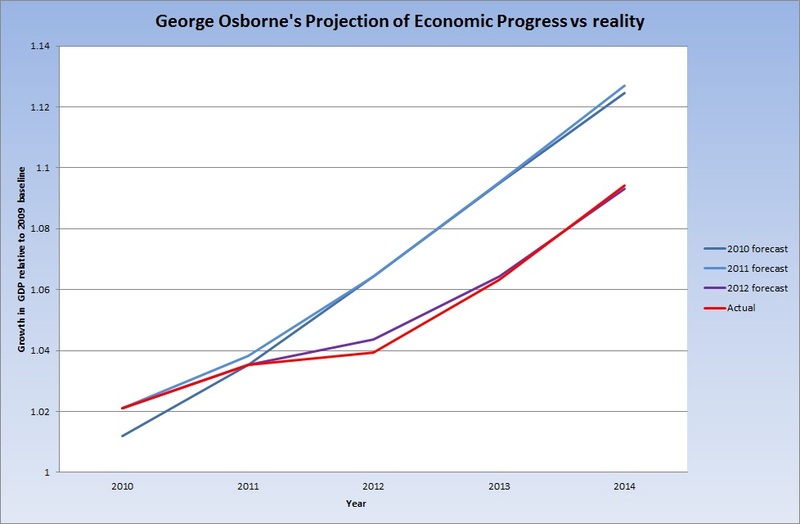 where in 2010 the chancellor predicted the economy would be compared to where it actually is. Again in 2012 the projections were much more accurate than 2010 and 2011. This is no coincidence, for it's in 2012 that he relaxed austerity as the economy floundered. I think at this point it's worth just covering some basics. GDP (Gross Domestic Product) is an estimate of the total economic activity of a country - all the shops and schools and factories and hospitals and building sites and hotels and bars and car mechanics and farms - summed together. As technology progresses and efficiencies improve - leading to greater productivity - the natural trend is for GDP to grow - this has been the pattern since the industrial revolution. This is why growth is always being talked about in any discussion of national economies. A recession is defined as two consecutive quarters when the economy shrinks (sometimes termed negative growth). To me, this speaks volumes as I think it indicates that the claims Osborne makes about how the economy works are completely wrong. The 'Confidence Fairy' as Krugman calls it is a myth, the private sector doesn't somehow explode because the public sector is retrenching. It is interesting that if you look at the first two quarters of the financial year 2010-11 when the policies of his predecessor when in place before the measures taken in June 2010 worked through to the economy at large, the economy continued to grow before going into a major slump until 2013 following a relaxation of the austerity measures. It is noteworthy I think that in 2009 Alastair Darling predicted a deficit for 2009-10 of £175Bn and it was actually £22Bn less. This is because he was very cautious in the assumptions he made about the effects of the fiscal stimulus. Osborne underestimated growth in 2010 and then overestimated it for all the subsequent years. You could, potentially write this all off as bad luck or the effects of other factors. I don't intend to discuss here in full why the other factors are probably irrelevant. But I will say this: according to Paul Krugman (and others) mainstream economic theory predicted that growth would be much lower than Osborne's projections. They made these calculations in 2010 and were scarily accurate. So who do you believe the chancellor who consistently over-estimates his own competence whilst ignoring academic economists. Or the academics whose predictions have been much more accurate and who have working models that tell you why their predictions will work? One of the reasons I like Paul Krugman so much is that he shows the data that supports his position - as opposed to the unsupported assertions by certain others. All this matters as the next budget is very likely to be similar to 2010. We may not suffer a recession as a consequence but look out for the growth projections made in the budget. I, for one, suspect they will be true-to-form and consistently over optimistic with the inevitable knock-on effect that the deficit projections will once again be completely wrong. If clearing the deficit really was as critical as Osborne claimed then we really would be facing massive interest rates. Conversely, the effects of austerity on the wider economy and thus well being of us all are somehow airbrushed out. A very conservative estimate of this is that the economy is £100Bn smaller than it would otherwise be. That is we are all £1500/year worse off. Every year. All this is avoidable. Counter-cyclical spending as advocated by anyone with just a basic understanding of Keynes' insights would promote growth and thus support tax revenues and manage the deficit easily. As long as Britain has spare capacity in the economy (and there's lots) and the ability for the government to borrow cheaply (record low borrowing costs) there is all the freedom in the world for Keynesian policies and thus the deficit would improve. Three big advantages of this approach. Firstly we might actually meet borrowing targets. Secondly the economy would be healthier overall and thus we would all be better off and thirdly the most damaging of cuts which have hit the poorest really hard could have been avoided. This is an economic argument but it is also a moral one. The question for me is that given the last 5 years, as Simon Wren-Lewis (Oxford Professor of economics) points out, to repeat the same mistakes as Osborne seems to intend is unforgivable. Either he is stupid or something else. I am really not sure whether his economic illiteracy is ignorance or malice. Either way he is probably the worst chancellor this country has ever had. Certainly the worst in my lifetime. I am sure, however much the Tories have managed to convince the contemporary public, history will not be kind at all. Sadly for those that suffer the most now, by then it will be too late. Anyway in the meantime look out for the economic projections in next's month's budget and then don't believe them and if we do go into recession in the next 18 months look out for some very creative excuses from the Rt Hon Mr Osborne. It did make me laugh. Although honesty compels me to admit that I may well be the first victim. However it reminded me of a line of thought I've had for a while and I thought why not blog about it. As I haven't written anything in ages... well not since earlier today. And twice. You will never hear me complain about stupid people – well almost. It’s a little more complicated. Come with me and see if you agree by the end of this. People who know me well, generally think I’m quite smart. I obviously can’t give an unbiased opinion on this but I do tend to agree. Now, there are clearly many people in the world who aren’t as clever as they think they are (I may well be one of them) but I think most people actually have a fairly realistic idea of how clever they are. Of course, by definition quite a lot of people will be of below average intelligence – somewhere around half in fact. I have no issue with this – people are what they are. We don’t get to choose which talents we are given and I am certainly not qualified to judge anyone. I have in my life seen plenty of prejudice against ‘stupid people’ but I am far more concerned with whether you are kind or not. As Martin Luther King said a child should be judged not on their colour of skin but on the content of your character. In the same way as skin colour, we don’t get to choose which talents we have but character is very much a choice. 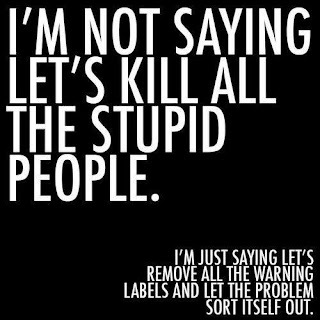 So I am very tolerant of stupidity (whatever that is) and not impressed by how often quite clever people are the ones I really wouldn’t want to know. And this is important. However as I said, it’s the choices that people make that most shape how I feel about them and for many being stupid is very different from acting stupid. We are all capable of lapses and a little kindness goes a long way but how often are people stupid because they can’t be bothered to think about it. Or if they just listened for a second would learn that a certain thing is a bad idea. Ignorance is acceptable to me. Wilful ignorance I don’t think is. It is often said that the road to hell is paved with good intentions. I don’t like this expression – not because it’s lacking truth but because it is, I think, an unhelpful focus. Of course in some situations this is true but how much better would the world be if people always had good intentions? So often problems stem from bad or selfish intentions. So good intentions should be the priority and then we can worry about the effects of said intentions. However and it’s the same however. It is easy to hide behind good intentions. Good intentions may not be enough and earnestness means going further and understanding the effects of ones actions and not just meaning well but doing all we can to ensure well. Of course we will never be perfect but a little bit of effort and engageness can go a very long way. We are all endowed with whatever gifts we have or not, but all of us have choices about how we interact with the world and how we treat people. It’s much more important to be kind than it is to be clever but kindness sometimes means being as clever as we are capable of. I wrote a long time back about ways that I thought football could and should be improved. Now we shall see if FIFA can be reformed enough to move beyond being an organised crime syndicate or whether it will be a return to business as usual. It’s quite clear that FIFA – as it stands – really stinks. I was very impressed by the FBI spokesman who talked about the arrests and extradition applications they’d issued. He spoke of the beautiful game and all that it means to so many people worldwide. It is long past time that FIFA took responsibility for its own ugliness – if not then whilst I don’t think football is doomed, FIFA surely is. Following on from last month’s election there will be a huge amount of debate as to why Labour lost. I do not have an answer to that question. There are lots and lots of factors and there will be plenty of commentators with their ‘wisdom’ offering views. One thing I am sure of though is that I haven’t changed my mind. On May 6th I firmly believed that the Conservative manifesto contained a series of measures which both individually and collectively were bad for my country. I haven’t changed my mind. The fact that the Conservatives won more votes than any other party does not mean they are right and I think it is vital that the Labour party does not run away from itself (even more than it has done) in response. I am not sure what a successful electoral strategy would look like. But I am sure that Tory policies are wrong in several key areas. I will write later about the Lobbying Act 2014 and the proposed repeal of the Human Rights Act. There is a lot to say about both of these. For now I just wanted to reflect on economic policy. I wouldn’t mind so much if this injustice was actually achieving something but it really isn’t. We are in a worse economic position in 2015 than we were in 2010. (Key indicators include the almost eradication of government capital investment, increased household debt and falling productivity). As I said, I remain absolutely convinced that David Cameron’s government will do a lot of damage to my country. The fight is not over. As the next few (painful) years roll on, we need a coherent argument. And then we need to win it. We must win the argument. Being right is one thing, but it is not enough. If I am wrong then I will say so, but I will also claim the right to point out over the next few years where I am vindicated in my assessments. It’s not about I told you so it’s about winning the argument so we can begin the rebuilding process. So I've been meaning to write a post about economics and where we are as a nation because of the massive gap between the media narrative and the reality. This disconnect has huge policy implications. I had composed a blog entry, trying to encapsulate the argument and I'd got to 2500 words so it wasn't exactly pithy. Then I discovered Simon Wren-Lewis, Oxford Professor and much more qualified than me to comment had put together a nice little series of blog entries that summed this up beautifully. So as well as being more qualified to say it, he'd said it better than me. P.S. I just want to point out that history will (rightly, IMHO) laud Gordon Brown for his handling of the crisis. History will not be kind to either Cameron or Osborne. For one as geeky-political as me, this is an interesting time. But I've decided not to fill up my blog with political posts. My political thinking is well documented here and elsewhere. However I will not be silent. I intend to produce a series of simple, visually-based statements.